George Hand Wright, N.A. 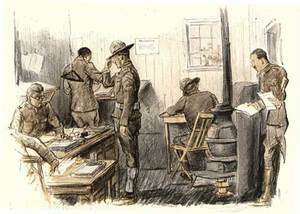 (member of the National Academy) was an extremely prolific illustrator, watercolor painter and printmaker with a long lifetime of work and achievement, but not much seems to have been documented about his personal life beyond the fact that he was born in Pennsylvania in 1872 or 1973 and died in Westport CT in 1951, where he had been one of the founders of that community of illustrators who worked for publications in New York City. Walt Reed mentions him in his excellent work, "The Illustrator in America 1900-1960s." He says that Wright was the son of a blacksmith; that he worked for magazines such as Century, Scribner's, Harper's, and The Saturday Evening Post, among others. 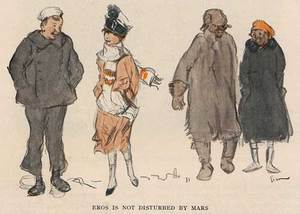 Reed tells us that Wright was famous for his detailed sketches, from which he later made his illustrations. I've included some of them here. 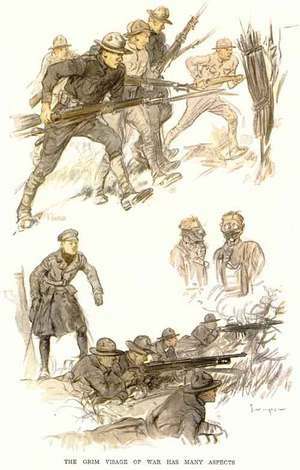 They were done for Harper's Monthly Magazine in 1918 when the United States was training its troops to fight in France alongside its British and French allies. 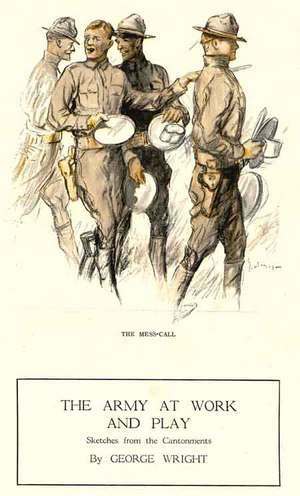 I'll be posting more work by this prodigious illustrator and have selected this batch to coincide with the Independence Day holiday being celebrated this weekend. Click on images to enlarge them. 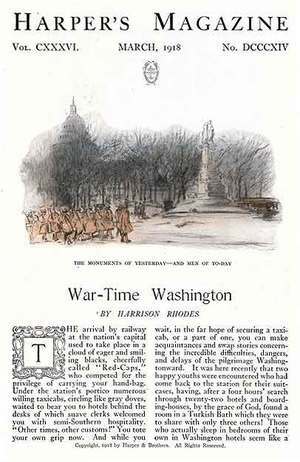 This is the title page of a lead article in which both author and illustrator described the wartime scene in the nation's capitol after troops had been mobilized by enlistments and conscription and the city appeared to be bursting at its seams. Here Wright manages to convey a scene with more life than any photo would be able to capture. Consider how dated photographs of that era appear in comparison to the pretty young woman accompanying the sailor. 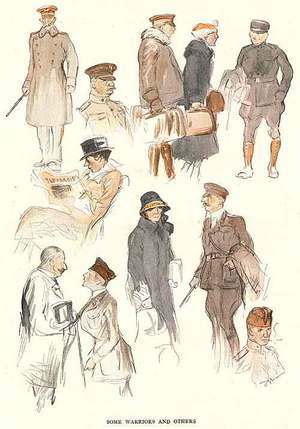 A full page of work from his sketchbook. constructed to meet the needs of a rapidly expanding army. 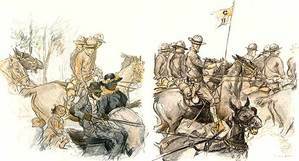 Friendly Invasion of the Sunny South," where this horse cavalry was in training. "The Grim Visage of War Has Many Aspects" is the last page of the article. It looks to be infantry bayonet training, gas mask drill, and the firing of automatic weapons under the command of a nattily attired instructor. I have recently published a book on Wright called George Hand Wright : An Artists Life Examined by Kirsten Jensen PHD in Art History . Wright's Nephew was my godfather so I have had an interest in him my entire life. if you would like to purchase the book please contact me. I am a former museum curator and now an independent art historian. I'd like to talk to you about George Wright and his interest in southern subjects around 1915. My telephone number is 352-245-5614. Like you, I think his work should be better known.